Nintendo's momentum with the Switch console has once again been a boon to the industry. According to The NPD Group's report for April 2017, hardware sales skyrocketed 37% to $195 million while video game software (digital and physical) increased 6% to $304 million. PC games software did fall 57% to $11 million, but all told, the industry saw sales rise 10% to $636 million. NPD analyst Mat Piscatella noted that this was the first time the industry actually experienced two consecutive months of growth since November 2015. "The Nintendo Switch was the catalyst for this growth with sales exceeding 280,000 units," he said. "The industry drove the highest April hardware dollar sales since April 2011. Nintendo owned the top 2 platforms in unit sales for the month, with the Nintendo Switch at #1, followed by NES Classic." After breaking franchise records in the previous month, The Legend of Zelda: Breath of the Wild had another very solid month, placing third on NPD's chart, but the title which drove software for the month was Mario Kart 8 Deluxe, which Nintendo of America already revealed set a franchise record of its own with nearly half a million units sold. Mario Kart is actually the best-selling racing franchise of all-time in the US, Piscatella said. If Nintendo keeps up its pace with Switch, publishers will flock to the system and its growing installed base. There's already a good variety of third-party support, as Piscatella pointed out: "Seven different publishers produced the top 10 April titles for the Nintendo Switch. Nintendo published three of the top 10, while Warner Bros. Interactive, Sega, Konami, Nicalis, Ubisoft and Activision Blizzard all published titles for the Nintendo Switch that appear in April's top 10." Another strong driver of April sales was Atlus' Persona 5, which maybe isn't as niche as some would have thought. "Persona 5 experienced the strongest debut month for any title in Persona franchise history, with packaged dollar sales five times that of the previous best-selling debut, Shin Megami Tensei: Persona 4," said Piscatella. As a follow-up to Ubisoft's positive earnings report it's also worth noting that year-to-date, the top two games in dollar sales are Tom Clancy's Ghost Recon: Wildlands, the best-selling game of 2017 through April, and Ubisoft's new IP, For Honor, which has held the second spot through April. 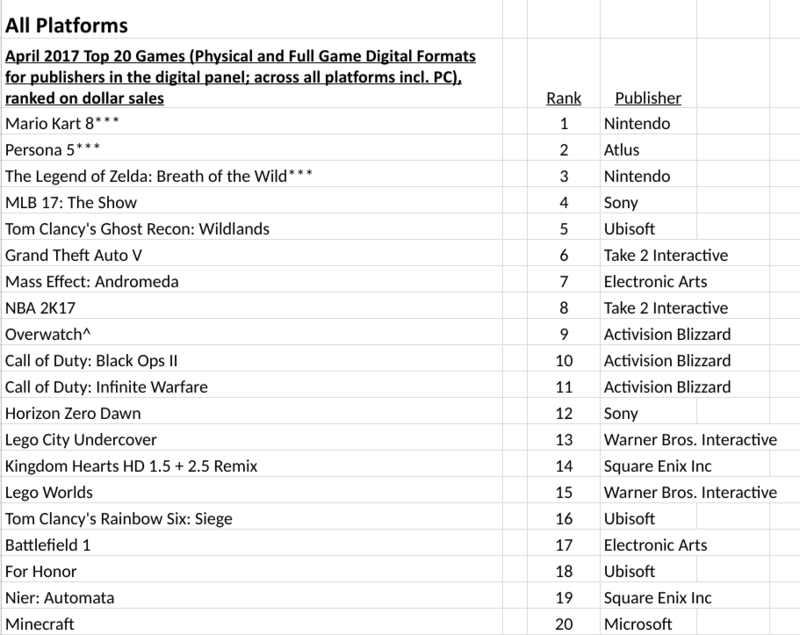 Lastly, in another encouraging step for NPD's digital tracking service, the data company confirmed that as of this month, digital point-of-sale full-game downloads for Sony and Microsoft are included in the summary's spend and game title rankings. The full top 20 chart can be found below.